Disclaimer: I have no finan­cial arrange­ment with Pubslush.com. Rather I have a pas­sion to help writ­ers cre­ate the finest books pos­si­ble, and Pubslush is pro­vid­ing me a plat­form in its blog to let me encour­age writ­ers. All opin­ions, instruc­tions, and errors are mine and mine alone. (I am repub­lish­ing it on my site.) Judy Vorfeld, May 2014. Who’s The Boss: You or Microsoft Word? Did you know that the way you for­mat your upcom­ing ebook makes a huge dif­fer­ence in terms of time and money saved? Huge. Of course, good writ­ing is crit­i­cal, but poorly for­mat­ted good writ­ing can cre­ate a col­lage of confusion. If you’re ready to begin typ­ing your ebook, per­haps I can help. With a strong for­mat­ting foun­da­tion, you’re well on your way to get­ting that ebook out to the public. Note: if you have cho­sen one pub­lisher (like Kindle) and do not plan to go with any oth­ers, then you may not want to learn the style tips I’ve included. However, you’ll find good ebook and writ­ing tips, along with bonus for­mat­ting ideas, so it may be worth your time to sift through these posts. If you want to for­mat an exist­ing book, you may still enjoy this series, but in this series I’m tar­get­ing peo­ple who are prepar­ing to write an ebook. And to help you move along so your ebook can be pub­lished, I’ll use Microsoft Word. It’s the pri­mary soft­ware of choice with pub­lish­ers. While there are dif­fer­ences between Microsoft Office for Windows and for the Mac, many tips will be sim­i­lar. I’ll avoid men­tion­ing any spe­cific ver­sion of Word, since there are so many. I’ll try to make it easy regard­less of which ver­sion you use. 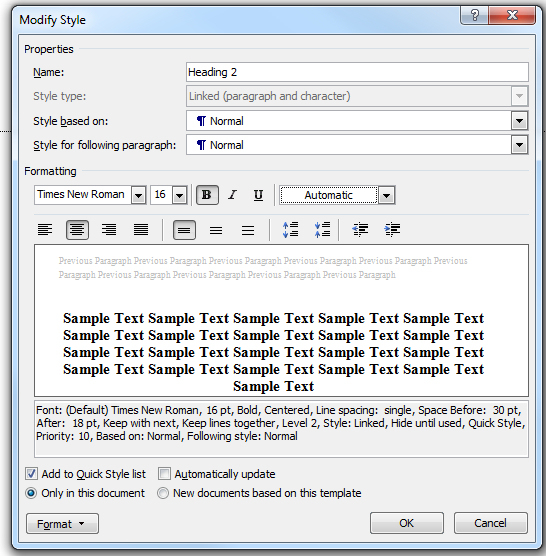 We’ll mainly focus on how to for­mat your upcom­ing book using Word’s “Normal” style as your slave, not your mas­ter. For just this one doc­u­ment, you want to set up a Word style guide, and you can always refer to it when you write other books. You mod­ify the styles right in your doc­u­ment. 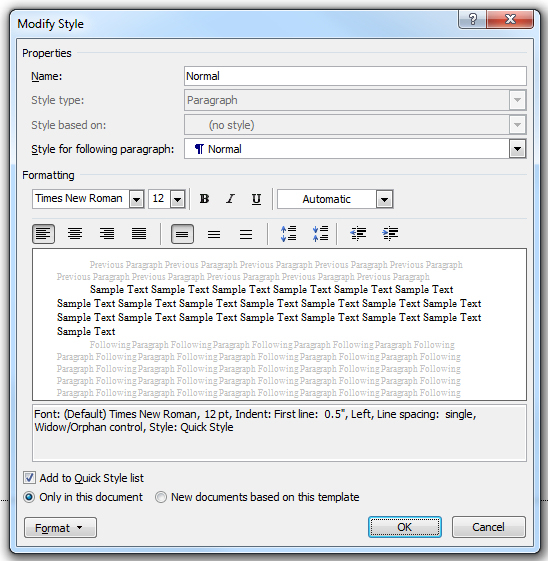 Since you are mod­i­fy­ing a doc­u­ment, not a tem­plate, all style mod­i­fi­ca­tions are just for this document. Note: Almost every­thing I say is a gen­er­al­iza­tion. Rules change. Procedures change. Software changes. Even ebooks change. I read using Kindle, and some­times get notices that one of the ebooks in my Kindle library has been updated. This is a Good Thing. 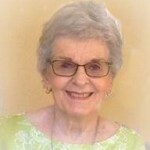 Kindle authors can make changes to their books at any time. But why plan on that ahead of time? You want the best for your upcom­ing book! Writers were cre­ated for a pur­pose. So were edi­tors, proofers, and for­mat­ters. So was Pubslush. Now you can raise funds for your book and hire a team to help make your book sing! Try to get a refer­ral for an edi­tor. While I’m an edi­tor, I edit a lim­ited amount of books. People like me do not have com­pe­ti­tion. We have col­leagues. There are many, many excel­lent proofers and edi­tors avail­able to help authors with their non­fic­tion, fic­tion, and ghostwriting. In order to under­stand the level of edit­ing you might need, take a look at one of the nation’s finest edi­tors’ orga­ni­za­tions, Bay Area Editors’ Forum. Just tuck this infor­ma­tion in the back of your mind for later, because it’s time to get started. You may be tempted to start out with bells and whis­tles as you go along … col­ored text head­ings, fun fonts of all sizes, and all kinds of excit­ing, cre­ative things. But why not con­sider the real rea­son you are here: your words. Your sto­ry­telling. Or your infor­ma­tional work. Focus on essentials. Consider start­ing with the basics and think about mak­ing things pretty later. You may decide to let some­one else do design fea­tures, and will have saved your­self a lot of time. Time when you could be think­ing up ideas for another book or ways to mar­ket this one. Plus, all ebook pub­lish­ers have their own rules for formatting. You’ll want sim­plic­ity in typ­ing your ebook, so that regard­less of which com­pany you use to self-publish, includ­ing aggre­ga­tors, you will already have done the most impor­tant basic for­mat­ting. This is not the time for pub­lish­ing glitz, unless your pub­lisher says so. If you enjoy hav­ing your brain spin­ning with infor­ma­tion, visit “Comparison of e-book read­ers.” Lots of dif­fer­ent for­mats for ebooks. Choose from the pub­lish­ers that will pro­vide the best oppor­tu­ni­ties for pro­mot­ing your book, which include: Amazon.com, iBooks, Barnes & Noble, BookBaby, Lulu, and Smashwords. This is just the tip of the ice­berg, but it’s a pow­er­ful tip. And remem­ber, if you use Pubslush to help raise funds for your book, they will also pro­mote your book for you. Even while you’re rais­ing funds. Every space in every Word doc­u­ment is part of a Word style. And in most ebooks, you will want to limit those styles so your editor/proofer/formatter isn’t faced with hours of unnec­es­sary cor­rec­tions. If you take some time to learn what works best so that basic for­mat­ting is your stan­dard (next to superb writ­ing, of course) … your holy grail … you’ll be ahead of the game. That’s why I’m here. You won’t use many of Word’s exist­ing styles, but you will cre­ate your own Word styles. I’ll show you how. I want you to be able to go to sleep at night with­out despis­ing Microsoft Word and its creators. Learn how to mod­ify an exist­ing style and how to change parts of a sen­tence (for exam­ple) with­out mod­i­fy­ing a style. 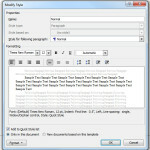 In Microsoft Word, Modifying means you change every instance through­out the doc­u­ment. But you can change text here and there with­out fear of chang­ing an impor­tant style. Because most pub­lish­ers don’t want a lot of extra para­graph spaces (think hard returns), they encour­age authors to cre­ate styles that work nicely with a min­i­mum of hard returns. The best part of this is that once you get the hang of it, you’ll be able to cre­ate even bet­ter doc­u­ments like pro­pos­als, let­ters, etc. And if some­one asks you to review a doc­u­ment, you’ll know that you can fig­ure out cer­tain things by the styles that were used in that document. Meet another best friend: Google. When you want to know some­thing about Microsoft Word, go directly to Google. Example: You may have acci­den­tally checked a box under Word Options, and now the top mar­gin is miss­ing. Officially, you have deleted the white space between pages. If you Google “Word 2003 top mar­gin miss­ing,” you’ll get a quick res­o­lu­tion. Example: You have just cre­ated a long list and real­ize it would look bet­ter alpha­bet­ized. Google “Word 2003 sort list alpha­bet­i­cally” and you’ll find many help­ful links. Okay, that’s the prin­ci­ple. Talking to Google saves time and stress. Guaranteed. Avoid pub­li­ca­tion sludge. Think generic. Even bor­ing. And above all: flow­ing text. It must be resiz­able. Your pub­lisher wants your words to flow in spe­cific devices, which means there are some actions you don’t take in Word, and oth­ers that are nec­es­sary to change accord­ing to the device read­ing it. The key to hav­ing a good man­u­script for your proofer, edi­tor, or for­mat­ter is to keep your styles sim­ple. Remember, you are in con­trol. Plain and ordi­nary is beau­ti­ful in the eyes of an ebook proofer/formatter. We’re get­ting close to the nitty gritty. Start your book with one inch mar­gins (Page Layout). But before we go fur­ther (Oh no, another delay! ), take a look at what to avoid and what may be okay when cre­at­ing your ebook. These will vary between pub­lish­ers, so I’m being gen­eral, but lean­ing toward picky pub­lish­ers. And trust me: you want a picky pub­lisher that insists on show­ing off your work in its best form. Readability trumps every­thing. Your reader is your main mar­ket­ing tool. Bullets and Numbering: it’s “iffy.” Some pub­lish­ers now allow them. Graphics (you can com­press them in Word, which may or may not look good. You can also find some­one who uses a pro­gram like Picasa, PaintShopPro, or Photoshop to make images smaller with­out los­ing clar­ity, 96 ppi [pix­els per inch] is good for Window,s and 72 ppi for the Mac). Most pub­lish­ers have a strict limit as to the file size of their ebook. Usually there are two major Normal para­graph styles for ebooks (exclud­ing children’s books, cof­fee table books, recipe books, and other spe­cialty books): authors gen­er­ally use para­graph indent style for fic­tion and block para­graph style for non-fiction. In this post, we’ll look at these two. Keep in mind that if you write fic­tion and like block style, that’s your choice! With the extra hard return elim­i­nated after each para­graph, you’re fol­low­ing the rules of some of the biggest pub­lish­ers and sav­ing your­self a lot of keystrokes. Just so you under­stand, you may need to cre­ate your own head­ing style for chap­ter and other head­ings (Acknowledgements, Foreword, About the Author, etc.). Grammar Tip: You’ll notice I just used the word “its” with no apos­tro­phe. In this case, its is a pos­ses­sive, and one of the few pos­ses­sives in English that does not use an apos­tro­phe. “It’s” (with an apos­tro­phe) means “it is” or “it has.” “Its” (with­out an apos­tro­phe) means ownership. Immediately below, you’ll see a sam­ple style for headings. Now, when you click the lit­tle pil­crow that reveals all codes, you’ll see a lit­tle square in the extreme left-hand mar­gin that tells the pub­lisher you have a head­ing style on that line. This is a Good Thing. Every time you want a chap­ter title in your new style, just high­light it (select) and click Heading 2 on the rib­bon below the Menu Bar (or Styles/Heading 2). Now you have the two main styles needed to com­plete the body of the book in a style that will please most publishers. Once you’ve estab­lished your styles, and are well into the book, you may real­ize that you want to change some­thing in your Heading 2 style: per­haps the spac­ing below the title. When you click Heading 2/Modify and make the change and then click OK, all the exist­ing Headings in your doc­u­ment that are already in that style will change. Same with any fea­ture within any Word style. However, you should be able to make many changes, with­out an impact on any other words or styles, just by high­light­ing the words and using the but­tons on the rib­bon. Think bold, ital­ics, align­ing a sec­tion of text, etc. If you just can’t man­age using styles, all I can ask is that you fol­low the other guide­lines I’ve given you, and keep things sim­ple in terms of for­mat­ting. Save all your artis­tic cre­ativ­ity for your writ­ing so your edi­tor — proofer — for­mat­ter can whip right through each des­ig­nated task. This will ensure your ebook is pub­lished more rapidly. Actually, I will ask you to do some­thing else: hire an edi­tor if you’ve been unsure. Why? Not so I can get busi­ness, but so you can con­duct your writ­ing process as a real busi­ness and rec­og­nize the need to have your book care­fully reviewed-proofed-edited before pub­li­ca­tion. So you can take more pride in your work. So you can grow in your professionalism. Since I not only edit and for­mat books, but am an avid reader, I am well aware of the num­ber of poten­tially great books out there that have been pub­lished before the preg­nancy was over. Oh, the errors in spelling, punc­tu­a­tion, cap­i­tal­iza­tion, usage, and for­mat­ting! There are rea­sons that this process takes time. But I also under­stand bud­gets. My sis­ter writes mys­tery series for kids, and one of her biggest chal­lenges is to find the funds to pay an edi­tor and a graphic designer (for her amaz­ing book cov­ers). I have always had author-clients who bat­tle with bud­gets, and now they have another option. Crowdfunding for books at . Yes, authors have raised funds on sites like Kickstarter, which is great, but oth­ers have not met their goals on such sites, and it’s under­stand­able. I believe that Pubslush came along at the right time, and by focus­ing only on rais­ing funds for books, will help authors get a more selec­tive, under­stand­ing audience. But whether you need funds or not, I want to see you rise to the top by rec­og­niz­ing and han­dling your future book as an unpol­ished gem worth the trou­ble it takes to shape and pol­ish it. Please don’t ask your next-door neigh­bor or best friend to proof it in their spare time. Unless they are pro­fes­sional edi­tors. And if they are, appre­ci­ate their value by pay­ing them. Back mat­ter: There’s usu­ally an “About the Author” area, and it’s also a good place to invite peo­ple to meet you on social media sites. Give your Twitter, Facebook, LinkedIn, etc. addresses. Plus web­site address and list of other (or future) books. This is where you put your mar­ket­ing savvy to work. Backup: In addi­tion to using Word’s back-up at File/Save, a good way to back up your book is to save it in the cloud. You can do this free by sign­ing up with a com­pany like Evernote.com. Every time you shut down your book file, go to Windows Start and find your file. Right click on the file. Choose “Send to” and choose Evernote.com. There’s a lit­tle learn­ing curve, but you can put Evernote on all your devices and access it from any of them, and you don’t have to worry about the integrity of a thumb/flash drive (although there’s noth­ing wrong with back­ing up to a thumb drive. Just do both. Your words are worth it). Bullets: Some pub­lish­ers, includ­ing Smashwords, allow bul­leted items, but try to use Word’s bul­let styles rather than cre­at­ing your own. Chapter Title Length, and Linking: Many authors pre­fer hav­ing a Table of Contents (TOC). And each pub­lisher has spec­i­fi­ca­tions for how to for­mat the chap­ter title length (if it is lengthy). Some pub­lish­ers pre­fer that you link all your chap­ters to the TOC and the TOC to the chap­ter titles, but if you’re not expe­ri­enced at book­mark­ing and hyper­link­ing, save this for a pro­fes­sional. Otherwise some­one, at some point, may have to undo your efforts. It’s com­pli­cated. Columns: Most ebook pub­lish­ers don’t allow columns. Copyright Wording: Wait until you’ve cho­sen a pub­lisher; every pub­lisher has a slightly dif­fer­ent for­mat. Sure, make a place for it, but don’t worry about exact word­ing until later. Ebook Readers: Here’s an eye-opener: “Comparison of e-book read­ers.” Lots of dif­fer­ent for­mats for ebooks. You’ll want to choose from the pub­lish­ers that will pro­vide the best oppor­tu­ni­ties for pro­mot­ing your book, which include Amazon.com, iBooks, Barnes & Noble, BookBaby, Lulu, and Smashwords. This is just the tip of the ice­berg, but it’s a pow­er­ful tip. Ellipses: Avoid using Word’s ellipses (three tiny peri­ods crunched together). Instead use Space-Dot-Space-Dot-Space-Dot-Space. This allows for a better-looking break at/near the end of a line with­out forc­ing text. Fonts: Try using only two at the most. Some peo­ple will use a serif (squig­gly) font like Times New Roman or Garamond for body text and a sans serif (non-squiggly) font like Arial or Helvetica for chap­ter head­ings, title, etc. Footnotes: Can be com­plex. Check your cho­sen publisher’s instruc­tions care­fully so they don’t have to be redone by your edi­tor or for­mat­ter. Foreword vs Preface: The fore­ward is usu­ally writ­ten by some­one other than the author and is always signed. The pref­ace, writ­ten by the author, talks about the rea­sons for writ­ing the book, the scope of the book and research involved, and often includes thanks for var­i­ous types of help in get­ting the book to the pub­lish­ing stage. Formatting: Bold and ital­ics are fine, but please avoid any under­lin­ing unless nec­es­sary. Front Matter: Kindle says front mat­ter may include “Title Page, Copyright Page, Dedication, Preface, and Prologue” — and rec­om­mends a title page at a min­i­mum. This is an exhaus­tive list of front mat­ter, although it is intended more for hard copy books. Global Change: When you want to change every use of a word, phrase, punc­tu­a­tion mark, etc., using Search and Replace. 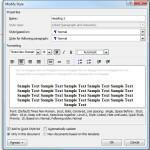 You can also do global style changes by mod­i­fy­ing an exist­ing Word style. Headers/Footers: since ebooks have no pages, do not use head­ers or foot­ers. Word has a fea­ture to delete head­ers and foot­ers. Hyperlinks: Some writ­ers under­stand HTML and enjoy hyper­link­ing. Most, how­ever, stress out when they think about cre­at­ing them. If you are at all uneasy, save it for your editor/formatter. In the mean­time, tem­porar­ily high­light the word/s you want linked and put the URL/Full web address to the right of the word/s and enclose in paren­the­ses. Icon Meaning: If, when you’re in the Formatting sec­tion (or any sec­tion), you don’t know a button’s func­tion, hover your mouse cur­sor over it and you’ll see an expla­na­tion. Justification: While Kindle does full jus­ti­fi­ca­tion, many pub­lish­ers pre­fer left, so unless you’re plan­ning on just using Kindle, it might be best to start with left (it’s also referred to as ragged right). Example: Smashwords for­mats for a num­ber of pop­u­lar read­ers, includ­ing Kindle, and its style guide says it only accepts left jus­ti­fi­ca­tion. Go fig­ure. Layout While Typing: Most writ­ers use the View/Print Layout for typ­ing their books. Just remem­ber your book will end up with­out pages. Here’s a way to keep track of where you and your proofer are: you can tem­porar­ily num­ber every line, quick as a wink, and then remove them with one click after edit­ing is done. Use Page Layout/Line Numbers/Continuous, and when done, use Page Layout/Line Numbers/None. Voila! Lingo: If try­ing to under­stand Internet Lingo stresses you out, book­mark NetLingo. Pages in an Ebook: There aren’t any. Think in terms of chap­ters. Page Breaks: Most pub­lish­ers allow them. Check first. Page Layout: Margins of one inch on letter-sized paper. Page Numbers: While print books always use page num­ber­ing, ebooks do not, since the key word in an ebook is “flow.” They con­stantly resize as they are read on various-sized devices from iPods and smart­phones to desk­top per­sonal com­put­ers. Pilcrow: You click on this icon to choose Word’s Reveal Codes sec­tion. Quotation Mark Placement: In American English, we end a quo­ta­tion with punc­tu­a­tion INSIDE the quo­ta­tion marks. “Like this.” And we only use dou­ble quo­ta­tion marks. In British English, quo­ta­tion marks are called inverted com­mas, and they use the sin­gle inverted com­mas more often. A quo­ta­tion also has punc­tu­a­tion OUTSIDE the quo­ta­tion marks. ‘Like this’. Sorting — Alphabetical: To alpha­bet­ize con­tent in your book, high­light the words (each word on a sep­a­rate line), click Home/Paragraph/Sort/Ascending. Sometimes there’s an AZ icon with a down arrow. Spacebar: Fine for mov­ing between sen­tences, but not for use to cre­ate tabs or other indents. Style Guide for your Book: Journalists use style guides all the time: Associated Press, The New York Times, etc. It all depends on the audi­ence. Most mag­a­zines and jour­nals have spe­cific style guides. Most authors use (or should use) a style guide so they can be con­sis­tent through­out the book in terms of cap­i­tal­iza­tion, punc­tu­a­tion, usage, for­mat­ting, graph­ics, pro­to­col, spelling, etc. Consider using Gregg Reference Manual, unless you’re writ­ing some­thing tech­ni­cal, edu­ca­tional, or sci­en­tific (such pub­li­ca­tions have their own style guides). When you’re ready for edit­ing, tell your proofer/editor that you used Gregg (or what­ever guide) and need them to edit accord­ing to that guide. Or cre­ate your own. Symbols, Wingdings, Special Characters: Usually not a good idea. Too often they can be mis­in­ter­preted dur­ing the pub­li­ca­tion process. Table of Contents: Okay to make a place for it imme­di­ately before the first chap­ter: just don’t hyper­link it for now. Tables: Often not allowed (Kindle is an excep­tion). You’ll need to con­vert to a PDF, then screen cap­ture as a graphic. You need some­one who works with graph­ics to help. Tabs: Usually not allowed: for­mat para­graphs w/first line indent instead. Text Boxes: Probably not allowed. You’ll need to con­vert to a PDF, then screen cap­ture as a graphic. You need some­one who works with graph­ics to help. Text Color: Usually all black is required. Text Size: Usually 12 pt for body text, with no more than 18 pt for the book title. Create styles for book title, head­ings, and body text. Typing short­cuts: avoid typ­ing same words/phrases: If you’re going to use the same words and phrases repeat­edly in an arti­cle or book, con­sider using Microsoft Word’s Auto Correct fea­ture. Word makes it easy. Example: if you’re going to have Mandy as a key char­ac­ter, assign her name let­ters or num­bers that, when typed, will bring up her name. If you have a lot of busy char­ac­ters in a novel, you might assign them 111, 222, 333, etc., if you won’t be using num­bers a great deal in your book. Type out a lit­tle table/form with who belongs to what code and tape it to your mon­i­tor. Version of Word to Save In: Find Word Options/Advanced/Lay out this doc­u­ment as if cre­ated in … gives a num­ber of choices, includ­ing Word ver­sions, Word for Macintosh, and some WordPerfect releases. It may be best to save as a Word.doc rather than Word.docx. At this point, some pub­lish­ers pre­fer Save As Word ‘97 – 2003. White Space is beau­ti­ful! As Wikipedia says, “A page crammed full of text or graph­ics with very lit­tle white space runs the risk of appear­ing busy or clut­tered, and is typ­i­cally dif­fi­cult to read.” Avoid large, clunky para­graphs or any­thing else that clut­ters the read­ing process. White Space Missing Between Pages/Top Margin: If white space is miss­ing between top and bot­tom page mar­gins in Print Layout View, go to Office Button/Word Options/Display/Show.